Plan now to attend the 2015 London Swine Conference! at the Hilton Hotel in London, Ontario. To provide a platform to accelerate the implementation of new technologies in commercial pork production in Ontario. To facilitate the exchange of ideas within the swine industry. Subscribe to this blog for further details of the program as it develops (and other news), or bookmark the Conference website. All past conference proceedings (2001-2014) are available on the website. 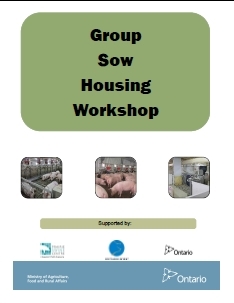 OMAF/MRA, with help from Ontario Pork and the Prairie Swine Centre, are organizing group sow housing workshops for early September, at the Festival Inn in Stratford. The workshop will be repeated on two consecutive days, so you have the choice of either September 2nd or September 3rd, from about 9:30 to 4pm. Cost is $50, and includes workshop manual, lunch, and coffee breaks. The Workshops will feature three Ontario producers describing their experiences transitioning to group sow housing systems. Hear their challenges and opportunities and gain practical advice you can apply on your farm. To discuss the advantages and disadvantages of group sow housing systems, Dr. Jennifer Brown and Dr. Yolande Seddon, both Prairie Swine Centre Group Sow Housing Researchers, will discuss the merits of different systems. Dr. Kees de Lange, from the University of Guelph, will talk on feeding sows in group housing. A key objective of the workshop is to stimulate discussion among the presenters and those attending. Everyone’s operation is different, so novel and creative approaches to managing a change in practices is essential for success. You can register by calling the Clinton OMAF/MRA office at 519-482-3333 or by email to sandra.mccann@ontario.ca. Space is limited and pre-registration is required by August 26th. If you would like more information about the workshops, contact Doug Richards at 519-482-3133 or doug.richards@ontario.ca. 2015 London Swine Conference Wants Your Input on June 9th! Producers, sponsors and industry stakeholders, please bring your list of topics and speakers for the 2015 London Swine Conference. A planning meeting will take place on Monday June 9thfrom 10 am to noon at the OMAF Resource Center Woodstock (401 Lakeview Drive). All are invited so please plan to attend and help shape next year’s 2015 London Swine Conference.